Welcome to 103.5 Wow FM Mga Woweets! Tune in na. 103.5 Wow FM is the newest FM station in Metro Manila playing OPM and pop hits. It features the popular DJ, Mr. Fu, who formerly work at Energy FM. 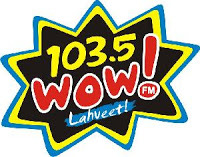 DWKX, known as 103.5 Wow FM, is an FM radio station in the of Advanced Media Broadcasting System, Inc. The station's studio is situated at Jollibee Plaza, Ortigas Center, Pasig City, with its transmitter located in Mandaluyong City.